A few days ago, the Blockchain Task Force gave a presentation on their progress. It absolutely deserves a standing ovation from the cheap seats. As a big evangelist of Blockchain and Distributed Ledger tech, I couldn’t be more pleased with their direction so far and how much it aligns with what I’ve written about over the last few years. I’ve been giving some thought with regards to the suggested e-ID initiative and thought I’d share my reflections. 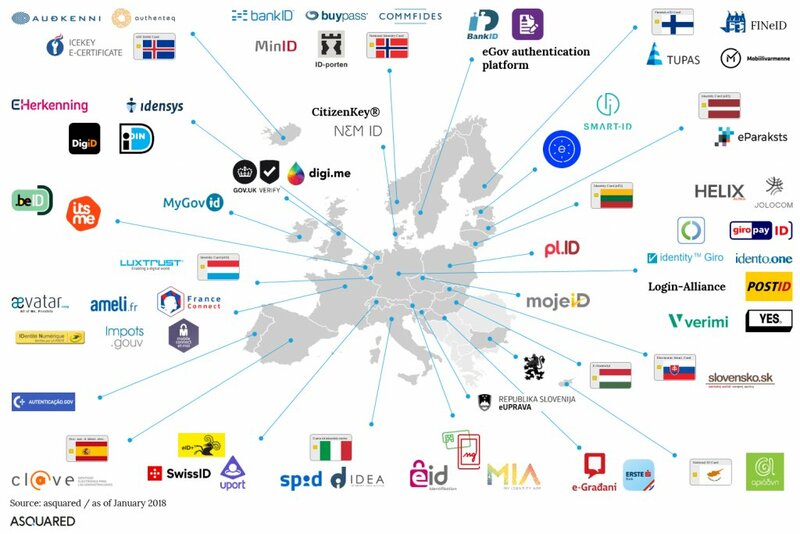 Ultimately, I have concerns that the government may be attempting to build its own e-ID solution rather than embracing those being built elsewhere. In my view, there is far too much risk involved with us trying to compete with our own solution and far more reward to be gained embracing third party solutions. Around this time last year I met with John Narraway, now the head of the business development side of the Task Force, to discuss self sovereign identities and how in my view they are Bermuda’s biggest opportunity to set a foundation for innovation. I wrote a bit of a primer about it here. I’m a very big fan of the efforts of the task force in this regard and its potential opportunity for Bermuda and while I am pleased to see forward movement, I am hopeful that we are creating an environment for innovation rather than attempting to innovate ourselves. While it is still early days, my fear is that the government could end up trying to build their own digital id solution. Even worse, it could be a centralized one controlled by the government, the very anti-thesis of a self sovereign identity which purports to place identity ownership in the hands of the individual or entity rather than a third party. To understand the problem with centralized solutions you only have to look at hacks like MtGox, Coincheck, Equifax, Ashley Madison, Paradise Papers…. We place ourselves at considerable risk if we hold the keys vs. delegating that risk to others. One of the problems is that this isn’t an empty space. There are many, many entities looking to build solutions. For example, here’s a chart of just some of the efforts in Europe. Unfortunately Bermuda is behind the curve and is talking about innovating in a crowded and competitive space. We’re too late to be a leader in implementation of digital ID solutions. Instead Bermuda should focus on being an innovative regulator. It aligns with what I’ve suggested in the past, government needs to be less hands on and more of a regulator and facilitator. Thus, I would much rather see government focus on creating a legislative framework to support third party identification systems rather than create our own. Let other parties build solutions, invite them to come here and embrace their solutions instead. Examples such as local providers like banks, utilities and legal firms being encouraged to authenticate the ids and claims of entities on those systems as well as the BMA working to recognize and accept verified identities on those systems for KYC and AML. That would be a much more welcome direction than Bermuda itself trying to build its own solution, and possibly one that offers much less risk. For those who have been following the government’s moves with regards to Distributed Ledger Technology (DLT), Premier Burt provided an update on the upcoming legislation that will be distributed for feedback soon. The recording of this morning’s parliamentary session is available here. The Premier’s statement is covered in the recording between 10:12am and 10:23 am. As I have covered in my previous writings on distributed ledger technology and cryptocurrencies, I am wholly wary of the cryptocurrency bubble and associated scams but am very bullish and supportive of government moves to provide a solid regulatory framework to encourage DLT innovation in Bermuda. The Premier’s mention of disclosure requirements sound encouraging. We absolutely need a clear regulatory framework to be in place that provides a secure, trusted and transparent process for Initial Coin Offerings (ICOs). I am highly skeptical of most ICOs due to their nature as a glorified uncollateralized loan agreement that provides little security for the investor. ICOs of this form are basically IOUs that provide the bulk of the reward to the token issuer while leaving the bulk of the risk with the purchaser. My concern is if potential investors do not fully appreciate the risks and no protections are offered to ensure an issuer cannot simply raise a bunch of money and then disappear. There are of course cases where this kind of financial arrangement is perfectly valid, so I await further details on what the task force has come up with to balance risks vs. opportunities. I am hopeful that provisions are being made to allow for the tokenization of securities. Namely, providing the ability for companies to issue rights of ownership in the form of tokens stored on a blockchain. The present means of issuing stock in companies is cumbersome and could well be made more accessible and transparent. Thus, legislation legitimizing the tokenizing of assets would be welcome. One of the concerns I have about the Premier’s statement is the suggestion that companies looking to offer an ICO will require consent from the Minister of Finance. I would prefer to see us establish a politically independent body that reviews and authorizes these rather than than place power and control in the hands of a politician. We’ll have to wait and see what is published in the coming weeks to find out more of what is intended by this legislation. Last night I attended a crypto currency meetup at ConnecTech. Despite not considering myself an expert in cryptocurrencies, blockchain and distributed ledger technology, I was surprised by the many misconceptions people have. As someone who has done a lot of reading on the topic and given a lot of consideration as to how Bermuda could build an industry around these technologies I was quite surprised. After responding to a few questions and suggesting I’d done some writing about it, people asked where they could read it. Thus, I’ve compiled a summary of all that I’ve written about how Bermuda can build a new tech industry around cryptocurrencies and distributed ledger technologies. Insurance is a maturing industry, Bermuda’s economy has stagnated. How can Bermuda reinvent itself? Feb 2016 – Diversify how exactly? The most important step in creating a new industry was illustrated in Marc Andressen’s piece “What it will take to create the next great silicon valleys, plural”. In order to create a thriving industry we need to create a streamlined regulatory environment that can enable it to flourish. June 2016 – The Blockchain explained… aka does the Premier have a mustache? A primer on the basics of blockchain using whether the former Premier had a mustache as an analogy. What are blocks, how are they chained and what does it have to do with creating a means for anyone to verify the data contained? Mar 2017 – Will Bermuda’s economy be disrupted by “FinTech” and “InsurTech”? What makes a “Tech” company different from a regular Finance or Insurance company? Why is Bermuda not a “tech” innovation center and does Bermuda have any real “Tech” companies? What can Bermuda do to change this? Nov 2017 – What are cryptocurrencies? A primer on cryptocurrencies and what they can be used for. What is bitcoin and why should we be wary of it? What are Initial Coin Offerings (ICOs) and why should we be wary of those? If there are such risks, is there still opportunity for Bermuda? Cryptocurrency markets are flashing telltale signs of being in a bubble. What are the indicators that it’s a bubble? What are the risks of ICOs? Is there still opportunity for Bermuda in this budding new industry? Feb 2018 – Crypto Contagion? Crack downs by regulators on cryptocurrency funding sources likely popped the bubble. Will the collapse of the $800 billion cryptocurrency market lead to contagion in other markets? Feb 2018 – Should Bermuda be investigating, pursuing and trying to incubate the development of distributed ledger technology? Many Bermudians are terrified of the prospect of government investigating and attempting to incubate cryptocurrency and distributed ledger technologies. Should we be doing it and what opportunities does it present? Why is proving you are who you say you are so difficult? What is wrong with current forms of identity and what challenges does that pose for conducting business? Why is identity the foundation of the future innovation distributed ledger technology can bring? What is Bermuda’s opportunity in introducing it? Finally I’d like to add a video of Arthur C. Clarke in 1974 predicting what computers would be like in 2001. An important thing to understand here is that in this video Mr. Clarke didn’t predict new technologies, he predicted technologies that existed becoming more accessible. Everything he talked about then already existed, it simply wasn’t accessible to the average person. His vision and foresight was having seen how other technologies like telephones evolved and became accessible. He then applied that evolutionary thinking to computers to understand that one day someone would have access to all of the same things he had access to then. This is a key thing to understand about technological evolution. Distributed ledger technology isn’t a revolutionary change. You could readily build anything today without blockchains and DLTs using existing technology. The evolutionary leap, however, is that the technology is being commoditized and made accessible to the point where you don’t have to have a PHD in distributed computing to be able to build distributed solutions. One of the things about the recent budget that raised an eyebrow are the very optimistic revenue targets. The Customs Duties estimate is quite high and leaves me wondering how the number was devised and what contributed to it. The concern being, if we cannot meet our revenue targets we won’t be able to match the deficit targets and would need to borrow more, so it is important that these estimations are accurate. A few questions arise. How accurately have we predicted revenues in the past? How much of an impact did the duty hikes the OBA made have? How much of an impact did America’s Cup have on customs revenues? Will the OBA’s duty hikes have created a permanent increase that will sustain revenues? Was the America’s Cup impact so small that revenues weren’t impacted? Are we counting on substantial import growth? How do we arrive at this higher number? Let’s take a look at estimates. 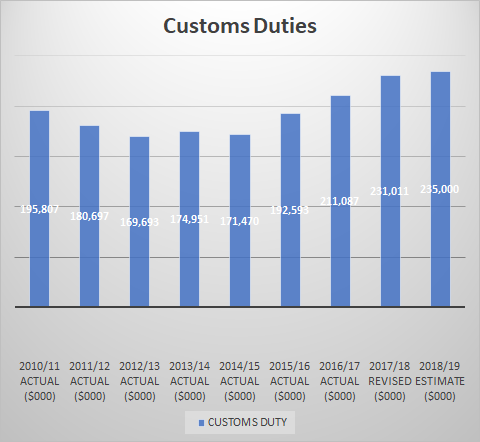 Customs duties for 2018/2019 are estimated to reach $235 million, surpassing 2017/2018’s revised numbers of $231 million. This is quite a high estimate and it raises the question of how accurate we’ve been in the past at estimating customs duty receipts. 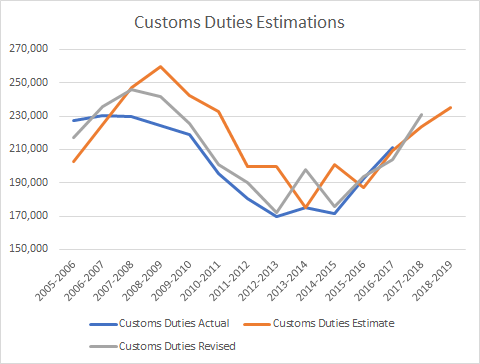 Here’s a view past customs duty estimations for review (note, the left axis is adjusted to start at 150k to provide a focused comparison, also note the chart is in 000s). What we can see looking historically (2005-2006 was the earliest data I could find) is that we initially tend to over estimate our customs duty receipts. The revised numbers have usually come in lower than expected and the actual numbers even lower. So even though it looks like last year’s revised numbers exceeded the estimate, there is the possibility that the actual number could come in lower as happened in 2013-2014. 2017-2018’s number seems to have been chosen as a benchmark. One of the big questions that arises is why the Customs Receipts number for this year is much higher and is it a reasonable approximation for 2018-2019. One of the big changes in the 2017-2018 budget was a hike in rates for a variety of categories. Justifiably this would have raised revenues. It is difficult to know by how much based upon publicly available numbers that I could find. It would be great to know if the Customs Department provides more detailed breakdown of imports within these bands to be able to understand how these tax hikes translated into increased revenue. Another questions that arises is how much of an impact did America’s Cup have? As this writer has argued many times, America’s Cup represented mostly a temporary stimulus of the one off event as well as an increase in population for a few years. While certainly many imports were brought in duty free, the additional purchases of the teams that resided here and the ACBDA staff likely weren’t. This likely contributed to increased customs receipts, however the removal of the AC stimulus does not appear to be a concern for the 2018-2019 estimation. 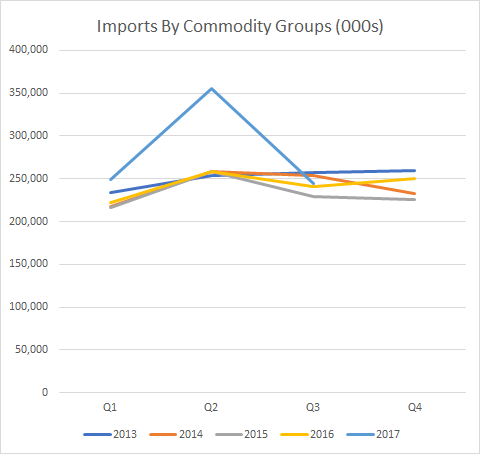 Let’s take a look at Imports By Commodity Groups data provided by the Statistics Department’s Quarterly Bulletin of Statistics to get an idea. Here’s a chart looking at year over year imports by quarter. 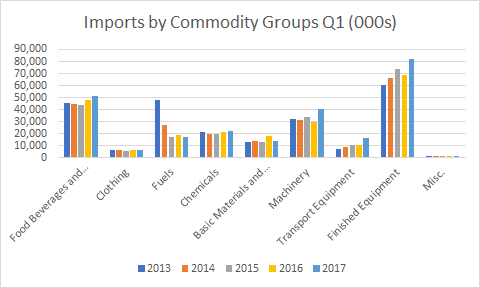 Considering currently available data for 2017, our Q1 imports were slightly higher and our Q2 imports were substantially higher. According to the currently available numbers, in Q3 we saw a drop back to 2016 levels. It is hard to say for certain that these increases were driven by America’s Cup and whether they were dutiable, but they do stand out as a substantial outlier. A bigger question would be whether these were sustainable increases or if they were one offs. Thus we can take a look at the commodity group breakdowns to see where the increases occurred. Looking at the Q1 data we can note that the bulk of the increases came in the form of Machinery, Transport Equipment and Finished Equipment. Can it be presumed that each of these categories represent one-off purchases rather than ongoing purchases? It could certainly be argued that machinery and equipment are something you purchase once and use for an extended period vs. something like food or fuels which are purchased on an ongoing basis. 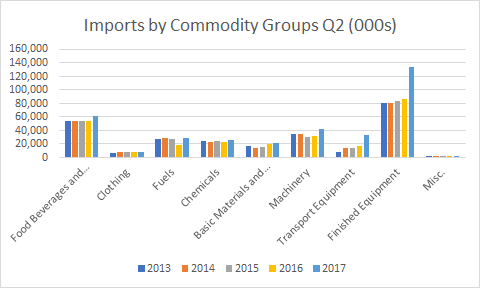 Taking a look at the Q2 breakdown we can see that again, the bulk of the imports came in Machinery, Transport Equipment and Finished Equipment. Now certainly, some of the imports may have duty free or temporary and related to America’s Cup, however it is hard to know how much. So how much of the revenue growth can we count on as sustainable? We don’t have the best track record when it comes to estimations. The tax increases are a wildcard as they certainly could have caused a hike but they just as easily could cause a drop in demand, especially if people bought things before the hikes. These estimates will be something to keep an eye on because if we cannot meet our revenue targets we won’t be able to match the deficit targets and would need to borrow more. 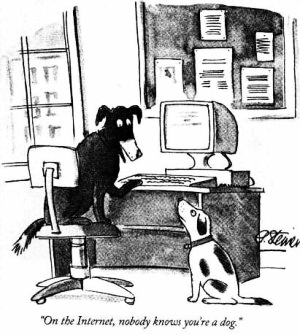 The “On the Internet, nobody knows your a dog” cartoon. It’s iconic and as relevant today as it was when it was first drawn back in 1993. Verifying someone is who they say they are remains a tremendous challenge of the internet and business in general. The trouble of not being able to easily identify someone on the internet is that we need to create heaps of inefficient and ineffective process to overcome it. We can change this. When you try to open a bank account, especially as a company, you have to complete endless amounts of Know Your Client (KYC) documentation to prove who you are. In reality, it is mostly security theater. Providing a copy of a utility bill to prove your address is rather worthless when you consider how easily one could be faked using photoshop. Worse, you keep having to sign and submit the same information and declarations over and over. All of this amounts to a tremendous amount of friction and waste. A whole host of bureaucracy is added to attempt to overcome this identity problem that adds a great deal of cost but not much value. This is an area ripe for disruption. How do you verify that you are who you say you are? Today you have a variety of forms of identification. You likely have identification issued by a central authority such as a government in the form of a passport and drivers license. You perhaps also have an online identity with a site like facebook. The trouble with a passport or drivers license is that it really isn’t very internet or business friendly. The best you can do at the moment is take it to a lawyer, have them photo copy it and certify that the paper copy is authentic. Though, even then people usually always want to see the original and make their own copies. There is simply no valid digitial representation of your government id. Worse, in cases such as a refugee fleeing a global conflict, your identity may lost, revoked or in some other way no longer be valid. In terms of digital representations of identity, the best we’ve got so far is federated identities like Facebook Connect. 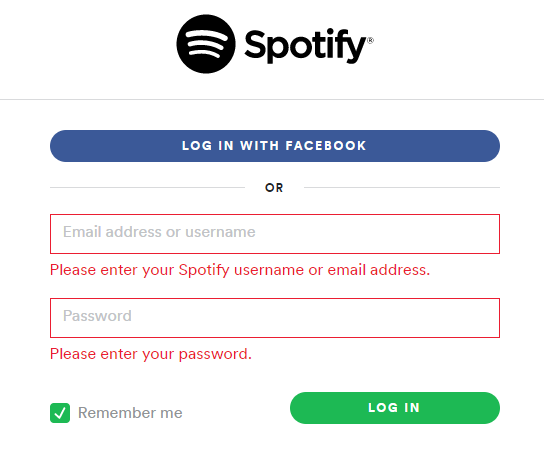 You might “log in with facebook” all over the internet which provides the advantage that you don’t need to create a new login or identity with each provider. You can manage the “claims” that each app or provider has to your data and the ability to revoke claims or control at almost any time via facebook. However it also brings with it the disadvantage that you still don’t really own or control your identity, facebook does. If facebook locks you out or deletes your account then you also lose access to every other place that you use your facebook identity. Facebook also theoretically has access to pretend to be you at every place you use it as a login. Finally, it isn’t really backed, verified or authenticated by any authority other than facebook so it is really only useful for places that don’t require stringent verification that you are really you and not Sparky the dog with a human name or someone pretending to be you. 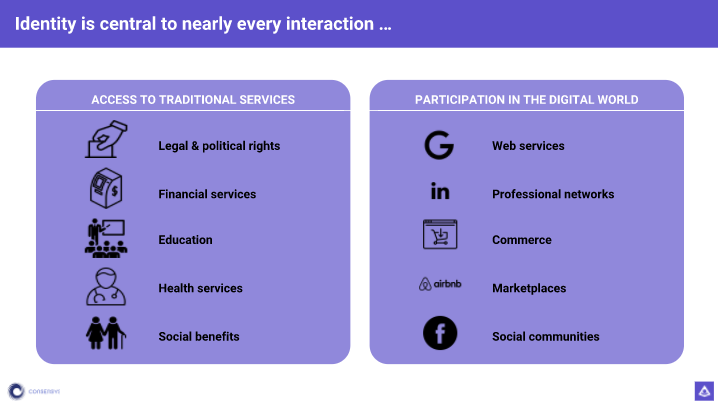 Identity plays a major part in every interaction across traditional services and the digital world. The problem is that you rarely can use the same identity across services spanning the traditional and digital worlds. So that’s today. Let’s talk the future. What if you were the ruler of your own identity? You’re its creator and it’s keeper. Alone, it doesn’t mean all that much, but the invention of the blockchain and distributed ledger technology, a considerable amount more is possible. Perhaps you use a service created around uPort.me or sovrin.org that allows you to create your own standardized Self Sovereign Identity that is recorded on a blockchain. You then go to the Bermuda government and ask them to certify your identity as valid, encrypting and tying your personal information like your citizenship, date of birth and marriage status to your identity. You own your identity and you control the ability for anyone to access this information. You can provide the rights to view as much or as little of this information to anyone who can verify that it was signed and validated as accurate using the Bermuda government’s digital signature. You then have control over who and what has the rights to access your personal data. You go to Belco and ask them to tag your utility bills against your identity to verify your address. You go to your bank and ask your bank to tag your credit profile against your identity. You ask your lawyer to tag your will against your identity. Any provider you interact with can encrypt details and information about you against your identity and if you so choose, you could have multiple identities. Again, you control who has claims to each piece of information stored against your identity and each bit of information can be validated by independent authorities like Belco, your bank or your law firm. With your own secured and validated identity, instead of having to sign worthless pieces of paper and constantly provide proof that you are who you say you are, you can simply provide claims to information stored against your digital identity. Your data only needs to be verified a single time rather than over and over. The cumbersome Know Your Client processes disappear into a verifiable digital transactions. Even better, using smart contract mechanisms you can avoid the need to divulge unnecessary information. Rather than having to show your id and divulge details like your date of birth (which puts you at risk of identity theft) to prove that you’re old enough to order a drink, a digital query could be made against your identity simply verifying that you’re older than 18. There is no need to know your exact date of birth. Similarly when trying to buy a car. A car dealer could verify against your identity that your bank has pre-approved you for a car loan. The dealer doesn’t need to know anything about what you earn or what your credit profile is, only that your bank has verified your identity as approved. Where is the opportunity for Bermuda? Bermuda has the unique position of being small enough to be able to enact change quickly while also having a mature business environment that could readily embrace and would probably welcome this change. Bermuda could set itself at the forefront of innovation by reforming our regulatory frameworks to embrace these technologies and concepts to significantly reduce the friction of doing business. The friction of KYC and other regulations on the ability to do business globally is a tremendous impediment to growth. If we can reduce that friction, we can get a jumpstart as a center for regulatory innovation and improve our position as a modern international free port. Should Bermuda be investigating, pursuing and trying to incubate the development of distributed ledger technology? If you went back to 1995 and told people that the internet is the future people would think you’re crazy. Tell anyone that it will allow you to shop and do many things online and most people would have told you its a problem that doesn’t need to be solved. The internet was a clunky, immature and awkward thing. Why would anyone shop online if you can walk into a store and buy the item? Who would do that? Why would anyone do banking online when they could readily walk in to a teller or call their bank? It sounded like a technologist’s pipe dream in the age where most web pages were barely readable due to horrendous backgrounds and annoying, blinking and scrolling content. From a 1995 viewpoint it was hard to see the problem to be solved. The friction of using the internet was substantially higher than the friction of existing processes. Over time, people started seeing the vision of what was possible and buying into it. Unfortunately, it drove hype. The hype created a mania where people vastly over estimated the amount of time it would take for the paradigm to shift. Today, we see many of those visions of the dot com boom having actually come to fruition. The trouble was that it didn’t take 1-2 years to occur like too many came to believe, it took 10-20. It required a significant amount of infrastructure development, revisions and friction reductions to occur. Today the advantages of shopping or banking online is obvious in a way that just wasn’t in 1995. At the root of it there isn’t anything terribly special about blockchain or more accurately, distributed ledger technology. Really, it’s a glorified distributed database, little more than combining the basic computing concepts of a linked list and a cryptographic hashing algorithm. However, there is elegance and brilliance in its simplicity. Sure distributed computing and storage technologies already exist. The trouble is that they are like the internet in 1995, they’re very difficult to work with and represent a great deal of friction. Building a global distributed multi-party database whose history can’t be changed but can be verified near instantaneously is no easy challenge and is accessible to few. This is why distributed ledger technologies hold so much promise. Distributed ledger technologies provide a substantial leap in making these concepts and techniques accessible and commoditized for many. There are a variety of challenging scenarios that that could be outlined that a distributed ledger is well placed to solve. Global payments processing is a tremendous point of friction that serves as one. Charging a credit card may seem like an instantaneous and pain free process from the perspective of a consumer. However it is fraught with problems, complexity and delays as many different parties are involved. One of the big challenges of global payments is fraud prevention. It is very difficult to verify the identity of a buyer so the system relies on trust of the intermediaries and a complex dispute resolution process. What if you could address this pain point and provide a better and instantaneous means to verify a purchaser, authorize a charge and settle the transfer of money. A process that today takes days and is fraught with problems could in the future take seconds to occur. That efficiency and reduction of friction has tremendous value but it is hard to see in the current implementation of distributed ledgers like bitcoin that are akin to flashing, scrolling websites like once existed on geocities.com. Don’t confuse bitcoin hype for the larger scope of what is possible and eventually arriving. Bitcoin is just one implementation of blockchain and the blockchain is just one form of distributed ledger technology. Bitcoin and its associated technology are like the Napster of the early days of the internet. Brilliant in theory but not terribly workable in practice. The simple truth too few can see through the hype is that Bitcoin is a sledgehammer solution for a problem a hammer can solve. The vast majority of transactions or processes have no real need for anonymity and the complex and costly processes used to achieve it. In the grand scheme of things, I place far more value on being able to purchase things cheaply than whether or not my bank knows what I’m buying or where. It’s the same with music, Spotify today makes music so accessible and cheap the hassle of using Napster to download music seems like more hassle than its worth. The real innovation with distributed ledger technology won’t be wholesale reinvention of existing processes and practices but instead augmentation. All in the name of reducing friction. We live in an increasingly globalized world with the advent of the internet. It is no longer rare for a company to be a global citizen. Instead, it is increasingly common that a company is less tied to a single nation and must balance the challenges of global trade, commerce and investment. The challenges of providing product, services and investments in one nation from another is complex and cumbersome and Bermuda has evolved a position where it can act as a free port to reduce the friction of global commerce. Acting as a free port, an intermediary to reduce the friction of commerce between countries, is our key value proposition. We have an established history of it. We have helped one country or region insure against disaster by hedging their risks against that of another region. Without our involvement, costs would be considerably higher and the prospects of whole regions being devastated by disaster and unable to recover would be far more likely. Bermuda has achieved this by offering the right pairing of infrastructure, location, regulatory support, adaptivity, timing and frankly luck. What competitive advantage does Bermuda bring to the table when it comes to distributed ledger technology? We’re small enough to readily adapt our regulations to provide the right environment for reputable firms to incubate their innovations built on this technology. We have great infrastructure, a strong location and a need to build a new industry. The timing is right and most of all, we’re well positioned to leverage our place in the world as a free port of global commerce and our strong reputation. As the world becomes more globalized and interconnected through the innovations technologies like the internet and distributed ledgers can provide, the need for intermediaries of global commerce will grow. It is easy to get confused by the whole debate and not see the forest for the trees. Are cryptocurrencies and the blockchain risky? Yes, I wouldn’t advise anyone to gamble with them without wholly understanding that the vast majority of cases you are gambling, not investing. Be willing to lose everything you put in. Are regions cracking down on shady investment schemes and banning cryptocurrencies? Yes, and they should. Is there an opportunity for countries who can react quickly and provide the right environment for the right kind of reputable businesses and an industry to thrive? Absolutely. Bermuda is well positioned to be that environment. I wholly support and applaud the move to eliminate the height restrictions in town. Why is eliminating the height restriction important? I have asserted for years now that one of the key causes of the housing crisis is a lack of adequate housing at the studio and one bedroom size. We really need to fix this imbalance. Allowing increased height residential dwellings in Hamilton would help immensely. The problem is that we’ve grown our housing supply at the upper end while the bulk of the growth in household types has been at lower numbers of people per household. Add to that an influx of young single guest workers and the bottom end gets priced out due to lack of supply. We desperately need to readjust our housing supply. I think the proposed elimination of the height limit in town will help, I just wish it was for more than just the economic empowerment zone. Ideally, a much larger scope of Hamilton, perhaps everything behind the Cathedral should be exempted. Disagree? 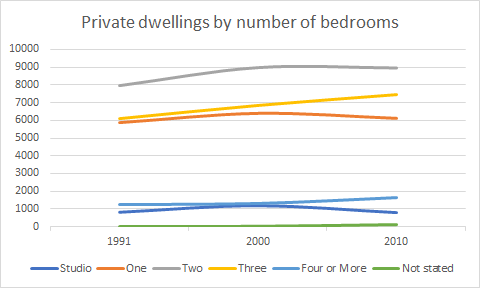 Well look at the stats from various Censuses and note that lack of growth in studios and one bedrooms. The bulk of the growth in our housing supply has been geared toward 2+ bedroom homes. 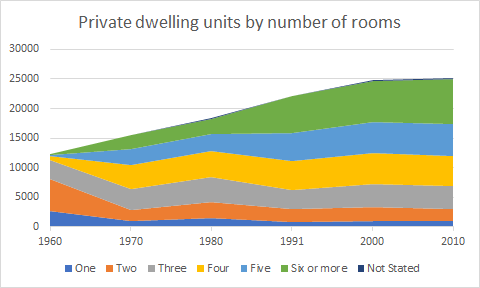 Further, when you look at the number of rooms overall, there has been substantial growth in everything but one and two room dwellings, a large shift from the 1960s. Well, that’s just rooms, right? 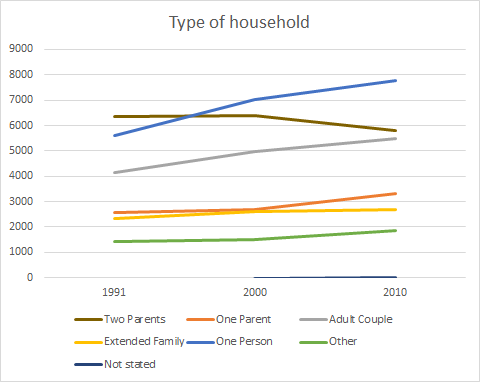 How about households? 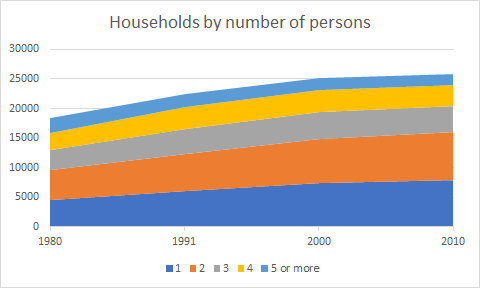 Surely the size of households have grown comparatively, right? Hmm… Well how about by type of household? There seems to be an awful lot of growth in one person, couple, one parent and other households. 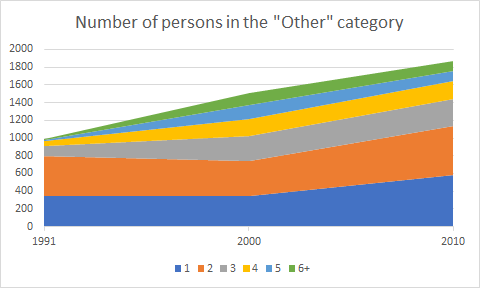 Lets take a closer look at “other”. This illustrates a problem I’ve been explaining for years. People keep trying to tell me that we have lots of housing supply. Largely the problem is we do, but its been developed all at the wrong end of the market. Housing supply at the lower number of person end has been constrained since the 1960s. We need to fix this by developing realistic affordable studio and one bedroom accommodations in Hamilton. Legislation supporting the development of Micro-apartments would likely go a long way to encouraging such development. One of the more interesting things to arise from today’s budget is the government’s pledge to introduce electronic fare collection for public transport. I think people underestimate how complex and challenging this can be to achieve if you get caught up in flashy solutions vs. looking at the root problems to be solved. Bermuda’s limited economy of scale makes it difficult to implement solutions in a cost effective manner. People are excited and suddenly have visions of systems like the British Oyster card powering our local transit. In theory it sounds great, in practice, perhaps not so much. These sorts of systems are expensive and complex. It would require a massive undertaking for us to implement it and the important question needs to be ask whether they’d be the right. In order to determine that, it helps to identify what exactly is wrong with our current paper / token system. Why is it a problem? Does the proposed solution address that problem? If not, why change? The overarching problem with the current paper system is that it is difficult to buy tokens. You have to go into a central location to buy them before you can take the bus. Otherwise you can pay using exact change. Thus, if you’re a tourist visiting the island or an infrequently travelling local, it can be difficult to use public transit. This is the clear pain point to be addressed. Would an Oyster card system solve this pain point? Not really. The trouble is that card based systems are designed for transit systems with large economies of scale. Systems like subway lines where it is affordable to put kiosks at every station. How about for Bermuda? Can we afford to put kiosks at every bus stop? Not likely. So, we end up with a solution that requires you go to to a central location to be able to purchase and charge a card. Which of course takes us back to the original problem we’re trying to solve. Its a fancy tech solution that sounds great on paper but doesn’t address the pain point. How do you solve the pain point in a simple, cheap and cost effective manner? Create a pair of smartphone apps for transit users and operators. Transit users could use a simple app to be able to register their payment details and load credit or purchase passes. That app can then be used to display a barcode when boarding. Transit users could also top up their accounts via existing sales points via cash rather than card. Transit operators could then have an app that scans barcodes and verifies their validity or triggers a ride charge against the users credit. The app could offer the added benefit of leveraging GPS to provide live route tracking as well as monitor passenger numbers as users scan in. Theoretically it could be tied into a wireless barcode scanner to make the process more seamless for drivers. Perhaps not an inspired technologically impressive solution like Oyster cards but simple, cost effective and largely implementable in both a short timeframe and at low cost. Here’s hoping the new government keeps it simple. I remain entirely confused by the whole diagnostic fee debate. Honestly there hasn’t been much clarity on the issue. Here’s my current understanding and thoughts with the wholesale admission that I don’t have all the facts and am not certain what the real situation is. Premier Burt and Health Minister Kim Wilson believe the rates set by the OBA were unreasonable. They have taken the step of stating that they will return the fees to the Health Council’s recommended amount and reimburse the various providers the difference between the OBA’s rate and the rate originally recommended by the health council. Dr. Brown and his various supporters do not agree with the Health Council’s proposed rates and that they should be returned to where they were. One of the biggest questions I have is how the prices are set. Are these fixed rates? Ie. all diagnostic providers are only allowed to charge these rates and nothing different. Are these fixed reimbursement rates? Ie, diagnostic providers are free to charge what they like but insurance companies are only required to reimburse at the set rates. This is a key point I haven’t been able to verify as of yet. The first is a very firm price control which I am not in favor of except in very special cases where due to our size a provider has a complete monopoly (eg, Belco’s rates would be a whole different discussion). However, in this case, similarly with grocery prices, I am not convinced a firm price control is the answer. The second is more reasonable in terms of a soft price control. It would mean Dr. Brown is free to charge what he likes but he really has to convince people or insurers to choose to pay extra for his service. In cases where the hospital facility is down or busy that would certainly be an outcome. Personally, I believe firm price controls should be an absolute last resort and usually are a sign of a poor regulatory environment rather than a good solution. A soft price control is more reasonable though still not absolutely ideal. It points to inefficiencies in the process that should likely be examined. Ultimately we need proper regulation to ensure a fair and equitable free market and price controls don’t achieve that any better than a complete lack of regulation. It’d be great if we had more clarify on how this is being achieved. How much contagion will the cryptocurrency bubble popping create in the greater markets? As noted last month the bubble had reached $800 billion market cap, about 1/3 the size of the dot com bubble. However, the SEC didn’t allow planned ETFs to proceed and regulators started cracking down which limited the bubble’s potential spread. The greed that drove the bubble has quickly shifted to fear as many people undoubtedly got wiped out investing money they didn’t have. Others have had to shift market investments to cover losses and still others may now be fearful that we’ve had far too good of a run in the markets for far too long. So the question now is, how much contagion will the collapse from $800 billion create in the greater markets? If significant, what impact will that have on Bermuda’s attempt to recover its economy?